Brahms: 3 Quartette op.64; 6 Lieder & Romanzen Op.93; Zigeunerlieder Op.103 etc. Secular German choral music is not exactly box office gold. A large amount of Brahms' work in that area, then, remains barely known by a concert-going and CD-buying audience that knows the fourth symphony or second piano concerto backwards. John Eliot Gardiner's revelatory series of concerts and recordings, placing the symphonies within a tradition – largely choral – of older works that were all but unknown in the nineteenth century has helped to redress the balance. This excellent disc from Consortium under Andrew-John Smith only helps the cause by emphasising the quality of much of Brahms' choral output. A small choir of just fourteen members, Consortium was only founded in 2006 and this is their first recording; a second disc of secular music by Reger is in the pipeline, also to be released by Hyperion. Although, in fact, several of the works here were conceived for vocal quartet (along the lines of the well-known Liebesliederwalzer), Consortium is small enough to maintain intimacy and delicacy. And there is little doubt that this is high-class choral singing: refined, sweet-toned, impeccably tuned, with subtly nuanced dynamics. In a brief note in the booklet, Smith justifies his decision to use a small choir for works undoubtedly conceived for a quartet of soloists: these pieces were to be performed at domestic gatherings by groups that invariably varied in size. In fact, for me, the quartet works – the Drei Quartette Op.64 and the Zigeunerlieder Op.103 – are the highlights of the disc; they also benefit from sensitive accompaniment from Christopher Glynn on a beautifully evocative 1872 Bösendorfer. The three Op. 64 quartets are actually rather substantial, particularly the first two, 'An die Heimat' (a setting of Sternau) and 'Der Abend' (Schiller). One might imagine the first of these to be a jolly piece of German patriotism, but it is actually a touching reminiscence of a land left behind, the song of a Wanderer. 'Der Abend' is extraordinary – particular the fractured, harmonically daring piano accompaniment – and, in this performance, often breathtakingly beautiful. My initial reaction to the Zigeunerlieder was slight disappointment in the lack of gypsy fire. One could well imagine a group of soloists, too, being able to make more of the verse and bring a bit more swagger to proceedings; there were a couple of occasions when Constortium's impeccability translated into inappropriate politeness, and a sense of them seeking safety in numbers rather than relishing the expressive possibilities that solo vocalists might. However, as we progress things undoubtedly hot up, and it's nice to hear the sopranos launch themselves with abandon at their top 'A' in 'Weit und breit schaut niemand'. In the more reflective numbers, too, the group are outstanding, with Glynn's Bösendorfer coming into its own with the cimbalom-like tremolandos in 'Mond verhüllt sein Angesicht'. The rest of the disc is made up of unaccompanied works, the Sechs Lieder und Romanzen op.93a, the Fünf Gesänge op.104 and 'Dem Dunklen Schoss der Heil'gen Erde' WoO20. They all show Brahms using his forces with imagination and all the skill honed over a long apprenticeship producing choral works for, among others, the alluring ladies of the Hamburg Frauenchor. So his imitation of violin tuning in 'Der bücklichte Fiedler' is effortless, as are the few other moments of onomatopoeia he indulges in, more often than not involving the sighing of the wind. There are more gems hidden away as well: 'O süßer mai' and 'Fahr wohl' from Op.93a, for example, and the substantial 'Im Herbst' from Op.104, full of surprising chromaticism and delicious suspensions, each verse rounded off by Consortium with a magical pianissimo. So, an auspicious recording debut from an excellent choir. 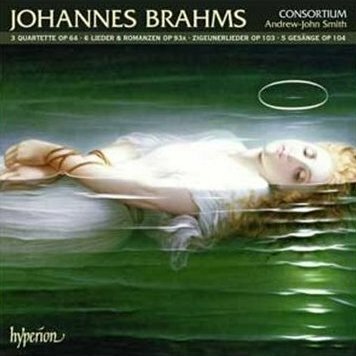 They are no doubt a little well behaved in the more unbuttoned songs, but the performances are consistently of the highest quality and when Brahms is at his reflective and melancholy best, so are Consortium. Hyperion's sound is a touch distant, but very natural and realistic.